Leading National Frozen Yogurt Franchise Saluting Service Members with 50% off the Franchise Fee and 15% off In-store Purchases Made on Military Mondays. sweetFrog salutes service members with 50% off the franchise fee. Servicemen and women are a perfect fit for franchise companies seeking qualified candidates who know how to execute a well-refined blueprint for success. sweetFrog Enterprises is proud to join the nation in honoring all service members, past and present, during May’s National Military Appreciation Month. The leading national frozen yogurt franchise has launched a massive month-long campaign to salute the troops – slashing start-up costs to help vets launch their own business and offering in-store discounts to thank all active and retired military men and women for their service. In May, sweetFrog has announced it will double its standard VetFran discount – offering 50% off the initial franchise fee ($15,000 value) – for any qualified active duty and retired military members who complete the online franchise application form on or before May 31, 2016. Additionally, sweetFrog has announced they are launching a veteran awareness program to assist all transitioning and retired service men and women as they begin exploring franchise opportunities. 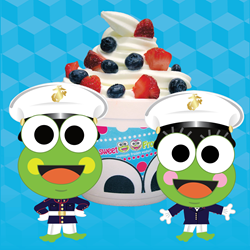 In addition to doubling the VetFran discount for prospective franchisees, sweetFrog is also saluting our military members with Military Mondays throughout the month of May. On each Monday through May 31, 2016, anyone with a valid military ID is invited to enjoy a special 15% discount off their purchase at any sweetFrog location. This is an increase to the 10% daily discount all veterans receive year-round. Sweet Frog (http://www.sweetfrog.com) is the fastest growing premium, all natural, self-serve frozen yogurt restaurant company in the country. With a wide selection of premium frozen yogurt flavors and fresh topping choices, sweetFrog was named Best Frozen Yogurt in the USA by The Daily Meal in 2014 and 2016. sweetFrog has 340 stores including both company-owned, franchise and independently licensed locations either open or under contract in twenty-four states in the U.S, Dominican Republic, United Kingdom and Egypt. The company was founded in 2009 and is based in Richmond, Virginia. Sweet Frog prides itself on providing a family-friendly environment where customers can enjoy soft-serve frozen yogurt, gelato and sorbets with the toppings of their choice. The company was founded on Christian principles and seeks to bring happiness and a positive attitude into the lives of the communities it calls home.